-How to find table where statistics are locked. From the view of the user it will look like the application completely hangs while waiting for the first session to release its lock. You’ll often have to identify these sessions in order to improve your application to avoid as many blocking sessions as possible. If you encounter a TM lock is means that two sessions are trying to modify some data but blocking each other. Unless one sessions finished (commit or rollback), you’ll never have to wait forever. Is there some kind of logical or physical structure called lock? How does the second transaction know when the first transaction has lifted the lock? Is there some kind of “pool” of such locks where transactions line up to get one? If so, do they line up to return it when they are done with the locking? Is there a maximum number of possible locks? Is there something called a block level lock? Since Oracle stores the rows in blocks, when all or the majority of rows in the blocks are locked by a single transaction, doesn’t it make sense for to lock the entire block to conserve the number of locks? The previous question brings up another question – does the number of active locks in the database at any point really matter? If you are interested to learn about all this, please read on. Since locks convey information on who has what rows modified but not committed, anyone interested in making the update much check with some sort of system that is available across the entire database. So, it makes perfect sense to have a central locking system in the database, doesn’t it? But, when you think about it, a central lock manager can quickly become a single point of contention in a busy system where a lot of updates occur. Also, when a large number of rows are updated in a single transaction, an equally large number of locks will be required as well. The question is: how many? One can guess; but it will be at best a wild one. What if you guessed on the low side and the supply of available locks is depleted? In that case some transactions can’t get locks and therefore will have to wait (or, worse, abort). Not a pleasant thought in a system that needs to be scalable. To counter such a travesty you may want to make the available supply of locks really high. What is the downside of that action? Since each lock would potentially consume some memory, and memory is finite, it would not be advisable to create an infinite supply of locks. Some databases actually have a lock manager with a finite supply of such locks. Each transaction must ask to get a lock from it before beginning and relinquish locks to it at the completion. In those technologies, the scalability of application suffers immensely as a result of the lock manager being the point of contention. In addition, since the supply of locks is limited, the developers need to commit frequently to release the locks for other transactions. When a large number of rows have locks on them, the database replaces the row locks with a block level lock to cover all the rows in the block – a concept known as lock escalation. Oracle does not follow that approach. In Oracle, there no central lock manager, no finite limit on locks and there is no such concept called lock escalation. The developers commit only when there is a logical need to do so; not otherwise. So, how is that approach different in case of Oracle? For starters, there is no central lock manager. But the information on locking has to be recorded somewhere. Where then? Well, consider this: when a row is locked, it must be available to the session, which means the session’s server process must have already accessed and placed the block in the buffer cache prior to the transaction occurring. Therefore, what is a better place for putting this information than right there in the block (actually the buffer in the buffer cache) itself? 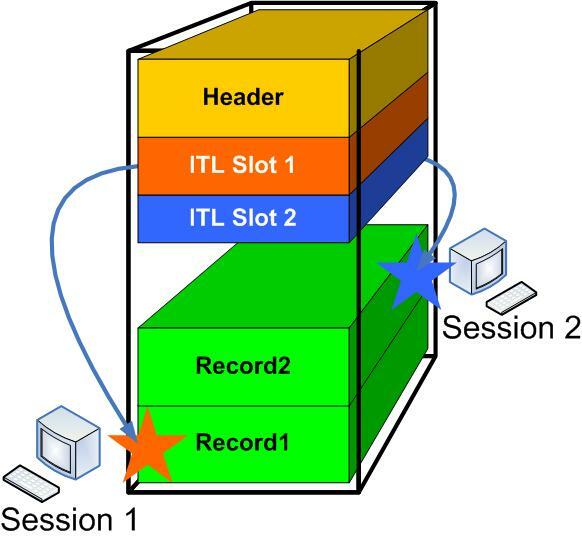 Oracle does precisely that – it records the information in the block. When a row is locked by a transaction, that nugget of information is placed in the header of the block where the row is located. When another transaction wishes to acquire the lock on the same row, it has to access the block containing the row anyway (as you learned in Part 1 of this series) and upon reaching the block, it can easily confirm that the row is locked from the block header. A transaction looking to update a row in a different block puts that information on the header of that block. There is no need to queue behind some single central resource like a lock manager. Since lock information is spread over multiple blocks instead of a single place, this mechanism makes transactions immensely scalable. Being the smart reader you are, you are now hopefully excited to learn more or perhaps you are skeptical. You want to know the nuts and bolts of this whole mechanism and, more, you want proof. We will see all that in a moment. The old value is recorded in the undo segments while the new value is immediately updated in the buffer where the row is stored. The data buffer containing the row is updated regardless of whether the transaction is committed or not. Yes, let me repeat – the data buffer is updated as soon as the transaction modifies the row (before commit). Undo information is recorded in a circular fashion. When new undo is created, it is stored in the next available undo “slot”. Each transaction occupies a record in the slot. After all the slots are exhausted and a new transaction arrives, the next processing depends on the state of the transactions. If the oldest transaction occupying any of the other slots is no longer active (that is either committed or rolled back), Oracle will reuse that slot. If none of the transactions is inactive, Oracle will have to expand the undo tablespace to make room. In the former case (where a transaction is no longer active and its information in undo has been erased by a new transaction), if a long running query that started before the transaction occurred selects the value, it will get an ORA-1555 error. But that will be covered in a different article in the future. If the tablespace containing the undo segment can’t extend due to some reason (such as in case of the filesystem being completely full), the transaction will fail. This is sort of like the social security number of the transaction. This information is recorded in the block header. Let’s see the proof now through a demo. Insert some rows into the table. Wait? There is nothing. The transaction ID returned is null. How come? If you followed the previous section closely, you will realize that the transaction ends when a commit or rollback is issued. The commit was issued inside the PL/SQL block. So, the transaction had ended before you called the dbms_transaction is package. Since there was no transaction, the package returned null. The transaction is gone so the ID is null, as expected. Voila! You see the transaction id of the active transaction from a different session. Compare the above output to the one you got from the call to dbms_transaction package. You can see that the transaction identifier shows the same set of numbers. 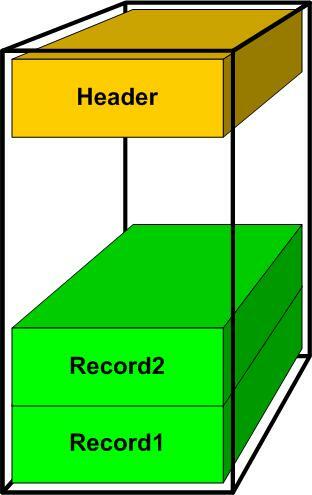 You must be eager to know about the section of the block header that contains information on locking and how it records it. It is a simple data structure called “Interested Transaction List” (ITL), a list that maintains information on transaction. The ITL contains several placeholders (or slots) for transactions. When a row in the block is locked for the first time, the transaction places a lock in one of the slots. In other words, the transaction makes it known that it is interested in some rows (hence the term “Interested Transaction List”). When a different transaction locks another set of rows in the same block, that information is stored in another slot and so on. When a transaction ends after a commit or a rollback, the locks are released and the slot which was used to mark the row locks in the block is now considered free (although it is not updated immediately – fact about which you will learn later in a different installment). Let’s see how ITLs really work. Here is an empty block. 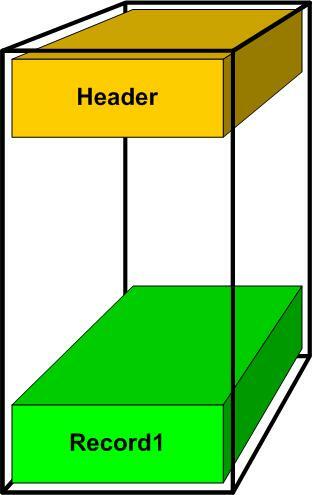 The block header is the only occupant of the block. The session does not commit yet; so the lock is active. Now a second session – Session 2 – comes in and updates row Record2. It puts a lock on the record – as stored in the ITL slot. I have used two different colors to show the locks (as shown by the star symbol) and the color of the ITL entry. As you can clearly see, when a transaction wants to update a specific row, it doesn’t have to go anywhere but the block header itself to know if the row is locked or not. All it has to do is to check the ITL slots. However ITL alone does not show with 100% accuracy that row is locked (again, something I will explain in a different installment). The transaction must go to the undo segment to check if the transaction has been committed. How does it know which specifci part of the undo segment to go to? Well, it has the information in the ITL entry. If the row is indeed locked, the transaction must wait and retry. As soon as the previous transaction ends, the undo information is updated and the waiting transaction completes its operation. So, there is in fact a queue for the locks, but it’s at the block level, not at the level of the entire database or even the segment. Now dump the data blocks 3576 through 3583. This is where the information on row locking is stored. 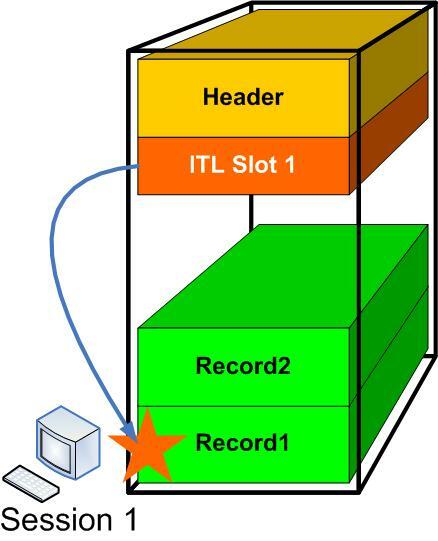 Remember, the row locking information is known as Interested Transaction List (ITL) and each ITL is stored in a “slot”. Here it shows two slots, which is the default number. Look for the one where the “Lck” column shows a value. It shows “1”, meaning one of the rows in the blocks is locked by a transaction. But, which transaction? To get that answer, note the value under the “Xid” column. It shows the transaction ID – 0x000a.019.00007c05. These numbers are in hexadecimal (as indicated by the 0x at the beginning of the number). Using the scientific calculator in Windows, I converted the values to decimal as 10, 25 and 31749 respectively. Do they sound familiar? Of course they do; they are exactly as reported by both the record in v$transaction and the dbms_transaction.local_transaction_id function call. Look at the entry under the Uba column: 0x00c00288.1607.0e. As indicated by the “0x” at the beginning, these are in hexadecimal. Using a scientific calculator, let’s convert them. 1607 in hex means 5639 in decimal – the UBA Sequence# (UBASQN). The value “e” is 14 in decimal, which corresponds to the UBAREC. Finally the value 288 is 648 in decimal, which is the UBABLK. Now you see how the information is recorded in the block header and is also available to the DBA through the view V$TRANSACTION. There you go – you now have the SID of the session. And now that you know the SID, you can look up any other relevant data on the session from the view V$SESSION. Transaction in Oracle starts with a data update (or intention to update) statement. Actually there are some exceptions which we will cover in a later article. A transaction is identified by a transaction ID (XID) which is a set of three numbers – undo segment#, undo slot# and undo record# – separated by periods. You can view the transaction ID in the session itself by calling dbms_transaction.local_transaction_id function. You can also check all the active transactions in the view v$transaction, where the columns XIDUSN, XIDSLOT and XIDSQN denote the undo segment#, undo slot# and undo rec# – the values that make up the transaction ID. 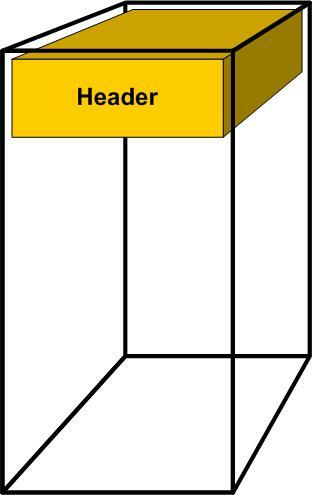 The transaction information is also stored in the block header. You can check it by dumping the block and looking for the term “Itl”. The v$transaction view also contains the session address under SES_ADDR column, which can be used to join with the SADDR column of v$session view to get the session details. From the session details, you can find out other actions by the session such as the username, the SQL issues, the machine issued from, etc.